Karela chips are made from bitter gourd or melon. They have a distinctive taste, which is why many people want to try a Karela chip recipe. 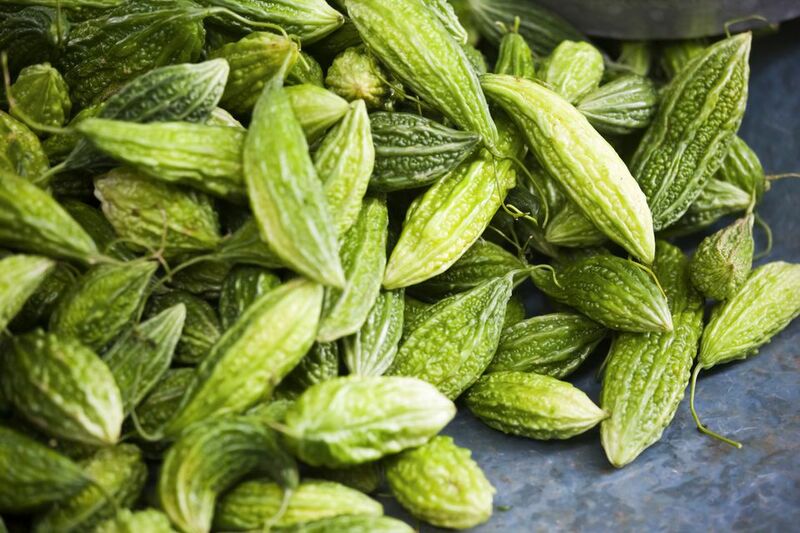 Bitter gourd is also known as momordica charantia, bitter melon, bitter squash or balsam-pear. The vine is grown in Africa, Asia and the Caribbean, though bitter gourd originated in India. It got the name karela from Pakistan. It has been used in some Asian beers instead of hops and is commonly used in stir-fry dishes. But in India, bitter gourd is often used in curry such as sabzi and served with yogurt. It can also be put into thoran when it is mixed with coconut, in mazhukkupuratti when it is stir fried with spices and as pachadi, which is a medicinal food for diabetics. Bitter gourd is often prepared with curry recipes or deep fried with nuts and is served as pachi pulusu, a soup with fried onions and spices. Overall, it is quite a versatile herb used throughout the region. Bitter gourd has been used in Ayurved and Hindu medicine. It is said to do everything from preventing cancer and treating diabetes to treating fevers as well as HIV and AIDS. Wash the karelas and pat them dry. Cut off the top and tail and then cut the karelas into thin rings. You don't want them too thick or they will not crisp up when fried. Put these rings in a plastic container and sprinkle 1 teaspoon of salt over then. Use your hand to mix well so as to fully coat with salt, or shake the container to distribute the salt evenly. Keep aside for half an hour. The salt will cause the karela to give off all its water and some of its bitterness. After half an hour, drain all of the excess water from the karela. Now sprinkle the turmeric over the karela pieces and mix well again in the container, or mix it by hand. Heat the cooking oil in a deep pan, on a medium flame. When it is hot, add the karela to it a little at a time and fry the pieces until they are crispy. Stir the chips often with a slotted spoon. When they have fully cooked, drain with the slotted spoon and put the chips onto paper towels. Sprinkle the chips with red chili powder and chaat masala and serve with rice and your favorite daal. Which Type of Couscous Is Right for Your Recipe?